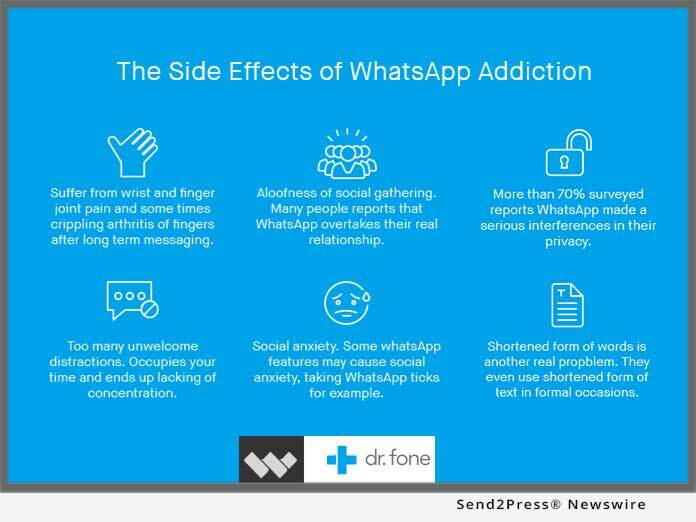 Home National News Desk Want To Find Out If You’re Addicted To WhatsApp? New Dr.Fone Test Can Tell You Just That! LONDON, U.K., Sep 19, 2017 (SEND2PRESS NEWSWIRE) — Whilst having a potential WhatsApp addiction might not seem to be a big issue, stopping to think about how often you use the app might alert you to just how much of your day is spent: checking, messaging and uploading media through WhatsApp. Dr.Fone have devised a clever test which asks a variety of questions about a person’s WhatsApp use. The answers are very specific so feedback at the end of the test can tell users exactly how ‘addicted’ they might be to the app.